The TUCKER CORPORATION was formed by Preston Thomas Tucker in Chicago, Illinois. Tucker was an 'autoholic' from a very early age and started his working life as an office boy at Cadillac Engineering. He went on to work on the FORD assembly line, sold Studebaker's, Packard's and Dodge's and finally became sales manager for Pierce-Arrow. During WWII, he decided that he would enlist the help of Harry Millar, the successful designer of Indianapolis 500 racing car engines, to help him with his vision of a post-war car of advanced design. Millar died in 1945, but Tucker pushed on with his 'car of the future'. The Tucker car progressed through several stages beginning with the 'Torpedo Sports' that had a centrally mounted steering wheel, front wings that turned with the wheels and a 'cyclops' third headlamp. He finally decided on the car that he called the '48 Torpedo, although the cars were actually made in 1946. The 'cyclops' third headlamp was the only feature that he retained from his original idea. His slogan was; 'TUCKER, The First Completely New Car In Fifty Years'. Innovations were chiefly the work of Tucker and former Auburn-Cord-Duesenberg stylist Alex Tremulis and the prototype was constructed in an old refurbished rented factory that had been used by Dodge to build aeroplane engines during the war. 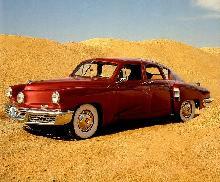 It had a bulbous, four door, fastback body and a pointed bonnet that incorporated the central headlamp. The large front bumper carried two grilles and the rear of the car had a huge grille almost the width of the car. Internally, the three across front bench seat was interchangeable with an identical seat in the rear to eliminate uneven wear. For safety, all the instruments were positioned beneath the steering wheel and the front seat passengers had a 'crash-proof' cell. The dashboard was heavily padded. The rear-mounted engine of the prototype was a huge flat-six, with overhead valves and fuel-injection, but it never worked well and only developed 150bhp. Tucker had six more engines of dissimilar designs built and the one that he ultimately chose was developed from the Franklin air-cooled flat-six used on Bell helicopters. It had been re-designed as a liquid-cooled, sealed system engine made entirely in light alloy and developed around 150bhp. It was transversly mounted with the intention to drive one rear wheel from each end of the engine. 0-60mph took 10 seconds and a top speed of 120mph was claimed. Although the car was never put into volume production, 37 Tuckers out of a total of 51 (including the prototype) came off the short assembly line. None of them were exactly alike. Most had a 4-speed manual Y-1 (Ypsilanti) transmission with either pre-selector or electric gear change. A few had Cord transmission and others had Tucker units. Tucker had raised several million dollars by selling dealerships and with supposed orders for 300,000 cars. He sought a further 30 million dollars from the governments Reconstruction Finance Committee. But in 1948, the Securities and Exchange Commission stated that because the car that Tucker was building was different to his original prospectus, he would be charged with fraud and his factory was closed down for several weeks. He was exonerated in 1950, but by that time, the Tucker Company had gone into voluntary liquidation. Tucker moved to Brazil in the mid 1950's where he briefly pursued the design of a sporty rear engined car with cycle-type wings and a 'cyclops' central headlamp. He was still seeking financial backing when he died in 1956.